When visiting London in a larger group or organizing an event that requires a spacious and complex accommodation, it is very important to find that hotel that combines modern facilities with impeccable services and accessible prices. This is the case with London Marriott Hotel Maida Vale. This accommodation is perfect for any family, business partners or romantic getaway in two. First of all, it is located near some of the most popular touristic attractions in London, such as Madame Tussauds, Hyde Park, The London Eye, Abbey Road Studios and many more. Moreover, you can also enjoy a great dinner at one of the exquisite restaurants situated at a walking distance. Great treats await you in the hotel as well, ranging from delicious dishes to vintage cocktails. You can also relax at the pool, sauna or gym. Not to mention the beautiful views and the sophisticated interior design. In order to get a Heathrow to London Marriott Hotel Maida Vale Transfer by rail, there are several options. First of all, you could take the train from Heathrow Terminal 1 (every 15 minutes), followed by a Tube from Paddington (every 5 minutes) and Kings Cross St. Pancras (every 10 minutes), ending with a 25 minute walk. This journey will take about 1 hour and 24 minutes in total. The second option is the Tube from Heathrow Terminals 1-2-3 (every 5 minutes), followed by a bus from Hyde Park Corner (every 30 minutes). This journey lasts about 1 hour and 24 minutes. You can also choose a bus from Heathrow Central Bus Station (line 724 every 60 minutes) via Watford, Beechen Grove (line 142 every 5 minutes). This trip lasts for 1 hour and 49 minutes). A Heathrow to London Marriott Hotel Maida Vale Transfer by car can be done by taking Great West Road/A4 Rd and then the A40 one. Heathrow Airport is at a 17.2 miles distance from London Marriott Hotel Maida Vale. This journey will take about 40 minutes, without including traffic. A Heathrow to London Marriott Hotel Maida Vale Transfer with 247 Heathrow Airport Transfer is going to take about 54 minutes, including rush hour traffic. 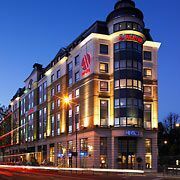 The price for a Heathrow to London Marriott Hotel Maida Transfer starts from 36 GBP.